In 48 hours, the Galaxy S IV will stop being a set of unconfirmed photos and videos from Chinese forums and be a real, official phone. A new generation. And while some mystery still remains over processor particulars, special eye-tracking software, and perhaps a hint of NFC-style Mobile Wallets, we have a pretty good outline of what we’re going to see on Thursday. Where the last Galaxy S smartphone made a splash with software, like Pop-up Play and S-Beam (while perhaps slacking on design), the Galaxy S IV will seemingly deliver solid hardware and software all in one package. Based on the most recent round of photos, videos, and Samsung-planted teasers, the Galaxy S IV seems to have the least amount of bezel we’ve ever seen out of a Samsung device. The GSIII curved all the way around letting the bezel expand around the mid-points, whereas the GSIV appears to be shaped a bit more like a Note or the GSII, with rounded corners, a curved top and bottom, and straighter edges along the side. Straighter is the operative word, since these leaks clearly depict some sort of arced contour around the edges. 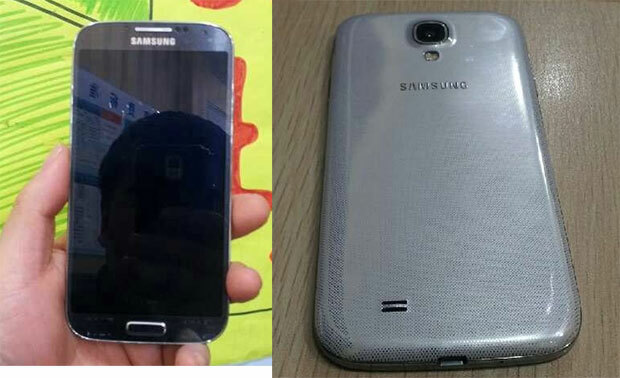 It appears that Samsung has stuck with a brushed plastic for the front and rear casing of the device. EVP of mobile Y.H. Lee told CNet that Samsung will continue to build phones made of plastic, knowing full well it can more efficiently manufacture a higher volume of phones to a higher volume of customers than using more premium materials. However, Samsung does seem to have added a metal strip along the sides of the GS4, which seems more legitimate than the metally-looking strip on the Galaxy S III. It’s slightly iPhone 4-ish on a concept level. We haven’t confirmed what type of material this metal-looking strip is, but SammyHub (who’s been integral in delivering early information on this and past Galaxy handsets) believes it will be aluminum. Introducing metal prominently to the Galaxy line could give the Korean handset maker yet another boost in their quest to defeat the iPhone. Though there have been suggestions that iPhone loyalists are growing tired and bored, many cling to the Apple for its solidly built smartphones with luxury feel. A little weight, and a nice sturdy feel might be a small game-changer for the Galaxy line, which has often been described as excellent though slightly heavy on the plastic. And according to SamMobile, the next generation Galaxy S will be slightly heavier than the Galaxy S III. The Galaxy S IV is believed to be slightly larger than its predecessor, though based on the sliver-like bezels along the side the device wouldn’t have to pick up too much real estate to fit the larger 5-inch display. We actually don’t have many confirmations on actual software features, but from the video this morning (if we believe it to be legitimate), you can see TouchWiz on top of Android 4.2.1. The audio tones for pressing buttons in and out of applications sound similar to the water-drip bloops on the Galaxy S III, though not quite identical. The video also shows the presence of NFC and S-Beam, which makes perfect sense considering it’s a huge part of Samsung’s brand offering as a whole. One feature that’s been rumored, though never shown in video or confirmed, is eye-tracking or head-tracking software that will automatically scroll down a page based on how your eyes are moving across the page. The NYT seems convinced of this, though hasn’t clarified just how Samsung will technologically implement this in the phone. However, it’s worth remembering that Samsung already has technology in the Galaxy S III (Smart Stay) that tells the screen to resist going dim while you’re looking at it. The NYT believes, and history seemingly suggests, that Samsung’s next Galaxy phone will make a big push in software, but we have very little understanding of what that entails. Samsung may introduce even more Cloud sharing/syncing services, even greater B2B/IT support, and more NFC software features. Speaking of, Samsung recently inked a deal with Visa, which could be a foreshadowing of things to come in mobile payments via NFC. We’ll have to wait and see. It’s also possible that Samsung will revamp their camera app. Big strides have been made in the camera/software department out of competitors like Nokia, HTC, and Apple. Samsung needs to step up their game, too. The processor remains a central question. Previously, rumors pointed to Samsung’s own Exynos 5 Octa processor, clocked at 1.8GHz with four main cores and four secondary cores. 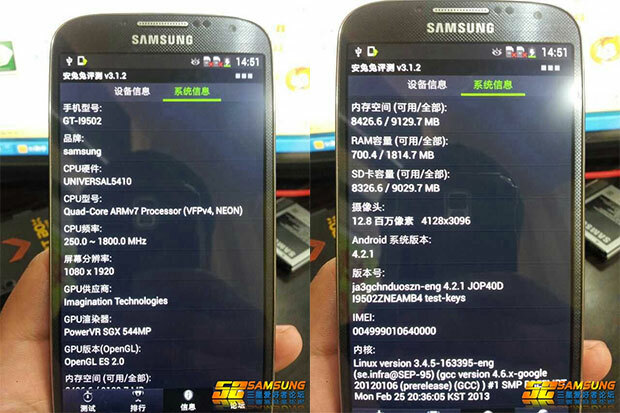 However, SamMobile reports that the 5 Octa was overheating, and won’t be ready for production, so the Galaxy S IV will instead use the Snapdragon 600 clocked at 1.9GHz. None of this is confirmed, but processing power affects lags and battery life, making it a central focus of most consumers’ needs, whether they know it or not. There has also been question over whether or not Samsung will use its Super AMOLED displays or go with an SoLux display, perhaps like the HTC One’s LCD3-based display. The HTC One and Galaxy S IV will face off in retail, with the One’s similar specs like a 4.7-inch 1080p display, a Snapdragon 600 processor, and 2GB of RAM. My gut tells me Samsung will stick with its Super AMOLED technology, but the CPU question is still a toss-up. With the Galaxy S III, the phone had an Exynos processor when sold in Korea and Europe, but was swapped out for a Snapdragon in the States. Perhaps that’s where this rumor came from? In any case, the Galaxy S IV will surely be a beast of unknown magnitude. After all, it is the next big thing. The Galaxy S IV will be announced at an event held in NYC on Thursday, March 14, beginning at 6pm. We’ll be covering the whole thing from start to finish. The top image is a render provided by TechCrunch’s Bryce Durbin.